This airticle is aboot the foonder o the Roman Republic. For ither fowk wi the cognomen "Brutus", see Brutus. The heid o this bust, the "Capitoline Brutus", frae the Capitoline Museums is tradeetionally identifee'd as a portrait o Brutus, datit 4t tae early 3rd centuries BC. 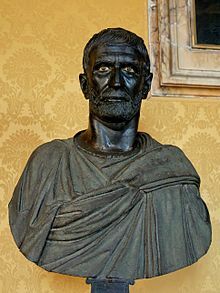 Lucius Junius Brutus (/ˈluːʃiəs, -ʃəs, ˈdʒuːnjəs ˈbruːtəs/) wis the foonder o the Roman Republic an tradeetionally ane o the first consuls in 509 BC. He wis claimit as a ancestor o the Roman gens Junia, includin Decimus Junius Brutus an Marcus Junius Brutus, the maist famous o Julius Caesar's assassins. This page wis last eeditit on 22 Mairch 2017, at 03:13.